With the constant rising cost of energy there has never been a better time to explore alternative means of heating your home or business. 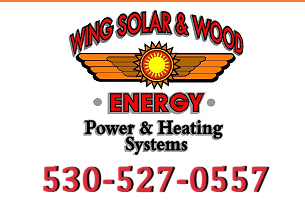 At Wing Solar & Wood Energy, Inc. we offer a complete range of alternative options. We have remained Northern California's leader in alternative energy solutions and we are eager to help you save money and energy through our many efficient and environmentally sound heating products. Below you will learn about the many products we offer. If you have further questions or would like to schedule a consultation with our client care specialist, please contact us toll-free at 1-800-492-4061. For your convenience, you may also request more information from this site. Solar heating can reduce a home's energy consumption by as much as 50%. Many people don't realize the energy required for domestic hot water of 15% - 20% of the average family's energy consumption is for heating water for laundry, dishes, showers and long soaks in the tub. In addition, to domestic hot water, solar heating can heat a home, pool or hot tub. Solar heating beautifully supplements hydronic heating systems, such as radiant floors, radiant baseboards and panels. Hot water and space heating together account for nearly half of your home energy consumption. Solar hot water replaces that energy consumption with clean, free energy from the sun. For further details about our solar heating options, please tour the solar heating page of this site or contact Wing Solar & Wood Energy, Inc. toll-free at 1-800-492-4061. Hydronic heating uses hot water for alternative healthy, environmentally, and cost-effective heating. This is accomplished in a variety of ways that include radiant, baseboard and forced-draft systems. In addition, hydronic heating does not dry the air as most forced air heating systems. Therefore Hydronic heat allows you to use lower temperatures and feel comfortable, which saves energy. For further details about hydronic heating please view the hydronic heating page of this site or contact our customer care team toll-free at 1-800-492-4061. 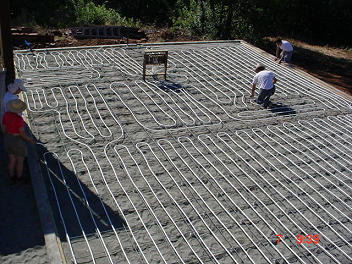 Radiant heating is a series of tubes that are installed in the sub-floor of your home or office. 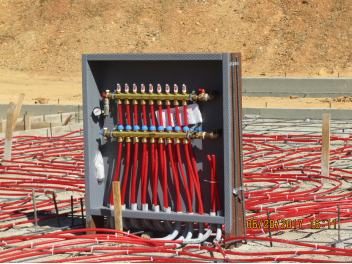 Radiant heating conducts water through tubes and allows for zoning control which is the ability to set the thermostat in each area of your home for optimum comfort and efficiency. Radiant heating is usually done during the construction of your home, however though retrofitting, an existing home for radiant floor heat is more expensive, it can be done and the investment will still pay for itself over time. Baseboard heating is setting baseboards throughout your home that are specifically designed to carry hot water and warm the area. Baseboard heating is also intended for zone control which allows you to heat each room or area as desired with a separate thermostat. Baseboard heating is ideal for homeowners who already have an established home and want to take advantage of a hydronic heating system. The forced-draft method blows air over hot water coils placed in the duct work of your new or existing system. The standard forced-draft system does not allow you to take advantage of the zone control concept. A variation of the forced-draft that allows for use of the zone control is the placing of individual radiators with fans in each room, as desired. This variation also takes up less space than most baseboard heaters. A Waterstove offers the safest way to heat any structure. All fire is removed from the home and only hot water is pumped inside providing you with purer, cleaner air and lower insurance rates than with an indoor wood stove. These units are also vented into the air, which eliminates the dangers of a pressurized boiler. A unit will burn almost any wood cleanly, safely and efficiently. In addition, your Waterstove will make your hot tub or swimming pool more enjoyable by extending your swim season. With minimum effort, your Waterstove will provide many years of dependable service. 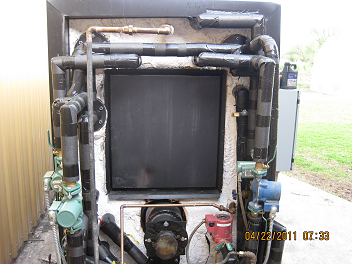 For further details about the Waterstove please tour the page of this site or contact us toll-free at 1-800-492-4061.